All the hype and histrionics over Aaron Judge and some of the over-reaching comparisons to Joe DiMaggio trigger the need to go back and re-visit what the Yankee legend was all about. He was born Giuseppe Paolo DiMaggio on November 25, 1914 in Martinez, California, one of nine children of Rosalie and Giuseppe DiMaggio, a crab fisherman father, an émigré from Sicily. It was all planned for Joe to become a fisherman. But the youngster’s real passion was playing baseball, a game his father called "a bum's game." On the sandlots of San Francisco, he developed baseball skills by hitting balls with a broken oar from a fishing boat. The kids he played with called him “Long Legs,” in Italian. He was always tall for his age. With the San Francisco Seals of the Pacific Coast League in 1933, DiMag hit safely in 61 straight games. The next year, playing shortstop, he batted .341, but hurt his knee. Yankee scouts Joe Devine and Bill Essick downplayed the injury in their reports to "Don't back off because of the kid's knee." "Getting him," George Weiss said on many occasions," was the greatest thing I ever did for the Yankees." The deal contained the clause that DiMaggio be allowed to play one more season for the Seals. Oh, did he play! DiMag batted .398, recorded 270 hits, and drove in 154 runs. In 1936, permission was granted for the young DiMaggio to drive cross-country with fellow San Franciscans Tony Lazerri and Frank Crosetti to the Yankee spring training camp in Florida. Lazerri turned to DiMaggio after the trio had concluded one day of driving and asked: "Would you like to take over and drive?" "I don't drive." It was reported that those were the only words uttered by DiMag in that three day cross country trek. On March 2, l936 DiMaggio finally reported to spring training. Red Ruffing greeted him with "So you're the great DiMaggio?" He played in his first major league game on May 3, 1936, at Yankee Stadium against the St. Louis Browns. In his first time at bat, he hit the second pitch into left field for a single. He had another single and then a triple to left field. Joe DiMaggio played 138 games in his rookie season, batted .323, with 29 home runs and 125 runs batted in. The Yankee Clipper was on his way. He would step into the batter's box and stub his right toe into the dirt in back of his left heel. It was almost a dance step. His feet were spaced approximately four feet apart, with the weight of his frame on his left leg. Erect, almost in a military position, Joe Dee would hold his bat at the end and poise it on his right shoulder - a rifle at the ready. He would peer at the pitcher from deep in the batter's box with a stance that almost crowded the plate. He was ready. 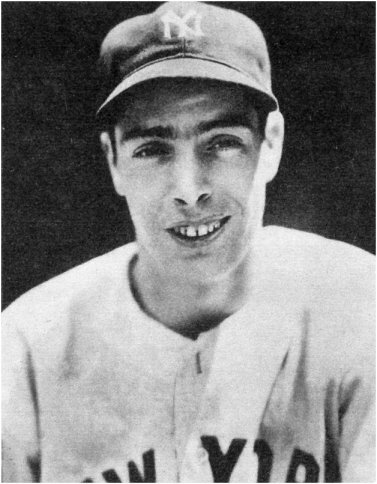 In DiMaggio's first four seasons (1936-39), the Yankees not only won four straight World Series but they also lost only a total of three Series games. "Joe was the complete player in everything he did," said his former manager Joe McCarthy. "They'd hit the ball to center field and Joe would stretch out those long legs of his and run the ball down. He never made a mistake on the bases and in Yankee Stadium, a tough park for a right-hander, he was a great hitter, one of the best." Secure in his feeling that he was the greatest baseball player of his time, Joe DiMaggio was fiercely concerned about his public image. Being silly in public was not for him. His shoes were always shined, all his buttons were always buttoned, his impeccably tailored clothes fit seamlessly. The great DiMaggio led the major leagues in room service. On road trips, no one ate alone in his hotel room as often as he did. It all fit DiMaggio’s personality which seemed placid, disciplined, calm. Only those in the Yankee clubhouse saw the legs scraped and raw from hard slides or diving catches. Only those in the clubhouse saw him sit for a half hour or more in front of his locker after the Yankees had lost or when he thought he had played beneath his exceptionally high standards. In 1941, the Yankee Clipper put together a season surpassing even his lofty standards. Batting .351, pacing the American League with 125 RBIs, smashing 30 home runs, he struck out just 13 times. He also put together the record 56-game hitting streak: some claimed it was the main reason for his winning the MVP award, narrowly edging out Ted Williams who batted .406. His career was one that most could only dream about. Yet, military service and injuries limited Joe DiMaggio to just 13 years in pinstripes. But what a time it was – in those 13 seasons the Yankees won 10 pennants and nine world championships. Winner of three MVP awards, two batting titles, a 13-time All-Star, Joltin’ Joe slammed 361 career homers, struck out just 369 times, averaged 118 RBIs and had a .325 lifetime batting average. The Yankee Clipper homered once every 18.9 at bats. EDDIE LOPAT: (DiMaggio teammate) Those statistics don't even tell half the story. What he meant to the Yankees, you'll never find in the statistics. He was the real leader of our team. He was the best. In 1951, the man they called the Yankee Clipper, retired at age 36. Management attempted to get him to perform in pinstripes for one more season. But he had too much pride, and too much pain and knew he was no longer the best. Joseph Paul DiMaggio left behind the imagery of a player who moved about in the vast centerfield of Yankee Stadium with a poetical grace. He was one who played when he was fatigued, when he was hurt, when it mattered a great deal, and when it didn't matter at all. "I was out there to play and give it all I had all the time,” he said. Elected to the Hall of Fame in 1955, Joe DiMaggio passed away on March 8, 1999 at age 84.